​Arnie Johanson describes himself as a shy man, but he’s not reticent when speaking of his love of poetry, his adopted passion. 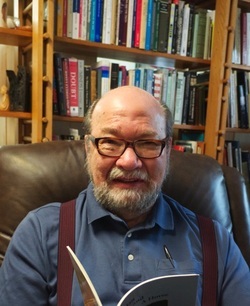 Poetry wasn’t always first and foremost in his life; he taught philosophy for many years in Minnesota before retiring to Durham and discovering the joys of verse while writing sonnets for his OLLI Shakespeare class. His life began in 1941 in Minnesota, where his grandparents had emigrated as homesteaders from Sweden and Norway many years earlier. Arnie, the youngest of three children, was born in the tiny town of Moose Lake about 50 miles from Duluth. His father was a minister in the Lutheran Free Church, a fundamentalist group that had separated from the state church in Norway and as Arnie recalls, “Their social mores were more like the Baptists — no drinking, no dancing, no card playing.” However, being the youngest child had its advantages; his parents weren’t particularly strict with him and were willing to let him make his own decisions. The family moved several times during his childhood, mostly to small towns in Minnesota and Nebraska. After graduating from high school, Arnie headed to the University of Chicago where instead of studying, he spent a year “playing cards and fooling around having fun.” He transferred to the University of Minnesota, became a serious student, and graduated in 1962. While there he met and married his wife, Alice. he and Alice and their three children moved back to the mid-west. He spent the next 33 years teaching philosophy at Minnesota State University Moorhead, across the Red River from Fargo, ND. Moorhead was a great place to bring up children and the grandparents were nearby. He loved his teaching and his students, but warmer climes beckoned upon his retirement in 1999 and they moved to Durham upon the advice of a friend. Alice had always been a keen gardener in Minnesota and wanted a longer growing season, but her hopes of establishing a garden in their new home were dashed because of their constant problems with deer. Where does Arnie get his poetic inspirations? Mostly from assignments given by an instructor in the workshops, or from books that are full of ideas. He finds it difficult to write at home, so over a cup of coffee at a Barnes & Noble Starbucks he sits and absorbs the atmosphere and then writes a draft in longhand before taking it home to type it out on the computer. Alice died in 2014 of breast cancer after 22 years in remission. It’s a more lonely life for him now, he says, but he keeps busy and finds solace in writing poetry and teaching. He and Alice had purchased a condo in downtown Minneapolis many years ago, and he returns there each summer. It’s odd, he says, but he feels more at home, more rooted there than anywhere else. Arnie’s work has appeared in several journals and anthologies, and his latest book of poems, “A Trunkload of Ephemera,” has just been published. His classes at OLLI will continue, unabated.